Ben Stiller proves not only can he be oddly funny, but great as the straight man in a film. “Tower Heist” shows this when his character Josh, the manager of a hotel where its Wall Street tycoon Arthur Shaw (Alan Alda) rests on the way top floor, finds out him and many others have been cheated from their boss taking money literally from their paychecks. In retaliation, he visits Arthur and responses to his actions by destroying the windows on Arthur’s Ferrari with great rage. This is just proof that Ben Stiller has no limits to what he can do and the unexpected turns this crime comedy takes. Upon getting their pensions removed, Josh and his friends decided to do the unthinkable and steal $20 million from a hidden safe that rests in the wall of Arthur’s room. Under the “Robin Hood” influence, they get help from Slide (an unbelievable, “at long last,” hilarious Eddie Murphy role), a crook that is heavily street wise and has a punk attitude to his persona. This “punk” element does get a tad tiring but puts Eddie’s magical use of one-linears to good rather than tossing them into a nearby garbage can like Pluto Nash or Beverly Hills Cop 3. 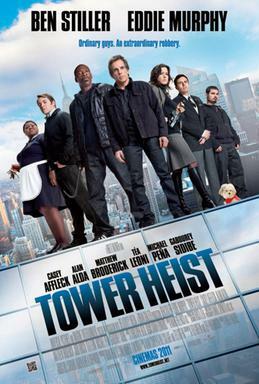 Once he gets involved, “Tower Heist” kicks into high gear tossing out one laugh after another. After the first 30 minutes, things turn as the rag-tag “rat pack” are trained to do the unthinkable and by the end you really root for them to make it out of a suite with a massive amount of dough. It seemed like a challenge to see what director Brad Bird could do with the animated filmography he had with Pixar. But to see him branch off with his first live-action feature debut was worth the wait and watch. 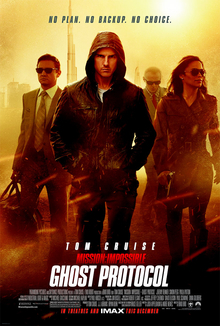 This fourth installment of the “Mission Impossible” franchise almost incorporates the plot elements and things from Brad’s previous work such as the working relationships that was present in “The Iron Giant,” the explosive “on the edge of your seat” feel from the action scenes in “The Incredibles,” the delivery and subtle feel the dialogue from various episodes of “The Simpsons” he worked on, and the complex nature that is often present in Brad’s features. Tom Cruise returns as Ethan Hunt as he finds himself on the lam again after the Kremlin gets blown up and results in act of war. In a way, I tend to feel this movie is somewhat of a reflection of the 9/11 paranoia when we called war with Iraq. This time, we get to feel what they felt as Russia (in MI4) is on the brink of war with America. The idea of another nation alone going to attack another is rather dark yet thrilling, but only if there was more to it seeing we focus more on Ethan’s mission. If that wasn’t bad enough, IMF has been shut down, leaving Ethan and his crew stranded in Moscow as they try to find the real perpetrator. To add more conflict, Ethan is being hunted down by a Russian inspector that believes he could be the central cause of it all. Along the way, viewers are treated to suspenseful action scenes and tons of gadgets. One notable highlight is Ethan’s climb up a tall building with magnetic gloves that operate like the Internet card to a laptop. The only problem with this feature lies in the pacing. In between each nerve-racking moments that build character or little breathers to let the viewer relax before the next complex scene. While that is fine, it tends to be in the way. The first Mission Impossible films had non-stop action and never stopped to take a break from the rushing around and chase scenes they are highly noted for. While it drags, “Mission Impossible: Ghost Protocol” does know when to be suspenseful and when to be centered on its characters. While I don’t considering it the greatest installment, it’s a nice entry to the series and a one that shows the talents of Brad Bird seeing how he some past experience with the scrip writing of “*batteries not included.” For an animation director’s first time in the chair of making a live-action feature, it’s a damn good attempt that really presents his eye for action films. 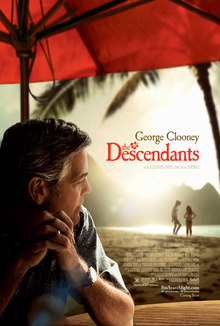 Had this movie be done as a straight-up comedy, “The Descendants” would have been rummaging close to the troubled waters of “The Weather Man.” However, what I didn’t expect was feeling teary at the end of seeing a movie that shows how difficult the world can be while somewhat hopeful. The feelings I had while watching this movie alone are hard to describe, especially when deal with themes of cheating spouses, a family falling apart, and morality. All these elements come together and somehow you get a feature you not only need to bring tissues to, but prepared from the tone that is laid out. Enter land baron Matt King (George Clooney) whose wife is in a coma from a boating accident with little chance of pulling out, two daughters that are nearly out of control seeing he is labeled the “back-up parent.” But when his 17-year-old daughter slips that his own wife had an affair, this sends him on a quest to track down this guy and give the chance to see his love affair one last time. While it sounds simple on paper, there is much more to the “Descendants” then one can imagine. Such is the character of Matt who keeps getting hit with these unexpected twists and turns that life throws at him and how he must deal with it. If knowing that his own spouse had a fling on the side was bad enough, try finding out your own daughter had a boyfriend without telling you. The scenes where Matt tries to coupe and get to know this slacker are a notable highlight. We are first thought to despise this character for his laid back and brainless attitude. But all that turns around when they have a private chat about love and the rough spots of life. It’s commonly rare for a movie to have a turn around like this. We are expected to be annoyed by this kid and later learn he doesn’t have that low of an IQ as we thought. That is probably what I appreciate the most about this movie. “The Descendants” is about how unexpected things can be and what twists and turns can be thrown at you. For better or for worse, we have to either deal with these happenings or treat them like “it’s the end of the world.” It’s not the idea of what our lives would be like in Matt’s shoes but more along the lines of can we handle issues that are complex as his. After “Prince Caspian,” I basically gave up on the Narina film series. The unnecessary addition of violence and cutting in important dialogue scenes made me feel this was falling in the trap of book adaptations like The Golden Compass or A Series of Unfortunate Events. Altering or removing certain sections not just so things appear translatable to the big screen, but for the sake of beefing it and out doing previous incarnations like Harry Potter. By the time “Voyage of the Dawn Treader” came about in theaters, my interest had already sailed and little hope prevailed in getting me to see it. But after giving the C.S. Lewis realm another try, I was surprised to see that all was right again in this series. Returning to this entry is Lucy and Edmund (save a cameo from Peter and Susan) as they have to deal with their cousin Eustace. A kid is more bratty than the children in Willy Wonka and the Chocolate Factory and thinks their Narnia talk is garbage. But once they are whisked away into the magical world once again (in probably one of the best special effects sequences where a painting of the ocean comes to life and fills the room with sea water) to help Caspian embark on a quest to save seven lords from a frozen coma. Part of the crew is a sword fighting rat named Reepcheep (voiced by Simon Pegg) who easily steals the show and becomes an interesting piece of conflict for Eustace. The entertaining aspect of these scenes is how they play off of one another in the vein of a buddy comedy. You want to see the kid’s heart warm up and along the way, we enjoy the journey he takes in “regaining his faith” and the ride as a whole. As they sail from island to island, the tone was mostly laid back and deviated from the heavy war feel the first two had. In comparison, “Lion, Witch and the Wardrobe” and “Prince Caspian” suffered from trying to be the next Lord of the Rings rather than formulate a style of its own. The staging of the battle scenes, the amount of gore, and even the delievery of the spiritual (or in this case, “religious”) elements felt like a junior version of Peter Jackson’s famed trilogy. It is here the series finally gets its own roots. Instead of relaying on a hard edge of fantasy, its much lighter as they come across invisible elves, volcanic islands with mounds of tempting gold, and a villainous fog that is determined to conquer with the power of fear. But in terms of how this supernatural element is rather weak. The entire third act alone could have been better with the crew facing their own fears or tying the entire quest to this one moment with the kids overcome what has been haunting them. By the time they reach this, there is no grand finale and feels like a recycled monster battle from a Ray Harryhausen film. Even I feel the subplot of Lucy being tempted with vanity should have concluded during this climax rather be resolved in one swig. At times “Dawn Treader” suffers from not having too much plot or being complex, but the way some things (changes) are handled. Most of them are done well such as Caspian having the choice of seeing his father or continue his life ruling Narnia and Eustace’s journey has a decent payoff. But then there are things like the evil fog or the continuing temptation Edmund has from the White Witch which don’t add up or feel disappointing to how they are wrapped up. Either way, its fair to say this is a step up from the previous entry that left me stranded and underwhelmed from the overly epic tone that thankfully this voyage didn’t carry.